Sounds like a bad country song. But the weather is warming up. Somehow, my brain translates this natural occurrence into a need to cook with fire... I'm the grill guy at my house. My husband researched the grill, of course, went to the store and got the grill, but there the relationship ends. I adapted this marinade recipe from one I found in a magazine article, probably in the 1980s. I have no idea of the exact year or publication, but it is so good, I use it for everything. Seriously, why would you buy a bottled marinade? Blend marinade ingredients together. 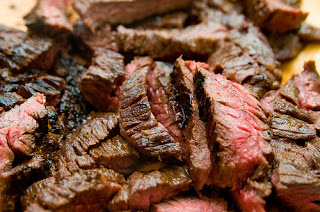 Pour over skirt steak. Refrigerate overnight. Grill meat for a few minutes, until medium rare. Allow to rest, then thinly slice. Blend ingredients together in a gallon-sized zipper bag set in a large bowl or in a plastic marinade container, like from Tupperware. 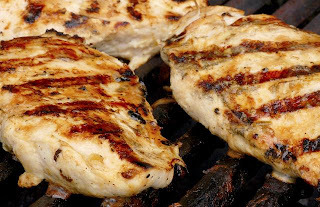 Place washed chicken breast in marinade and leave in refrigerator for about an hour. Grill until done. Allow to rest for fifteen minutes. Slice in thin strips. Blend ingredients as described above. Place shrimp or seafood in marinade and refrigerate for 15 or twenty minutes. Drain marinade and discard. Grill seafood, then allow to rest for a few minutes.